ST_VoronoiLines computes a two-dimensional Voronoi diagram from the vertices of the supplied geometry and returns the boundaries between cells in that diagram as a MultiLineString. Returns null if input geometry is null. 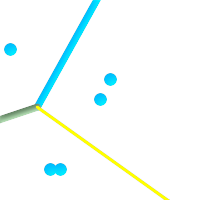 Returns an empty geometry collection if the input geometry contains only one vertex. Returns an empty geometry collection if the extend_to envelope has zero area. 'extend_to' : If a geometry is supplied as the "extend_to" parameter, the diagram will be extended to cover the envelope of the "extend_to" geometry, unless that envelope is smaller than the default envelope (default = NULL, default envelope is boundingbox of input geometry extended by about 50% in each direction). Availability: 2.3.0 - requires GEOS >= 3.5.0.